Marbella House in one of the best known and most sought after residential developments in Marbella. It is located on the second line of the beach in the best area of the residential centre of the city; next to the beach, promenade and the Plaza del Mar leisure centre, which has a supermarket, fitness centre, bars and restaurant. All services within reach without the need to use the car. It is a completely enclosed urbanization with 24-hour surveillance and surrounded by beautiful gardens, communal swimming pool, solarium, sauna, squash court, gym and storage room. A few meters from one of the best beaches in Marbella and a short distance from the historic center of the city. 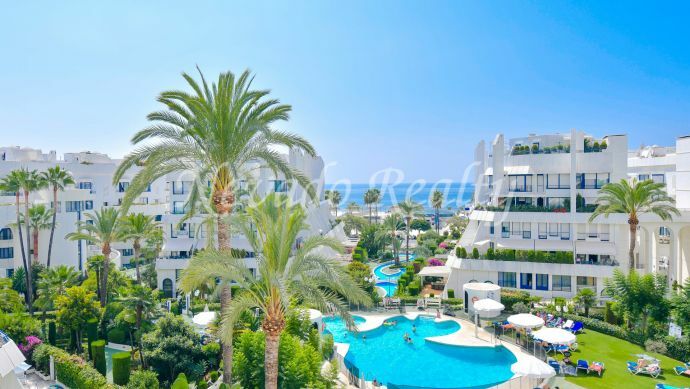 Why would you like to live in an apartment in Marbella House? It is quiet and at the same time a familiar urbanization, totally closed and safe, conditioned to facilitate the access to people with little mobility, with a few tropical gardens and wonderful care and with an exterior swimming pool and with some interior facilities of sauna and gymnasium that allow the visitors, be single, couples or families with children, to enjoy the urbanization and the good time of the city without having to leave it if they do not wish it. The Marbella House urbanization was built at the beginning of the nineties, at the same time that other luxury urbanizations were being built in the same area of the city as for example Gran Marbella and Atrium in the surroundings of the streets of Arturo Rubinstein, Camilo José Cela, where our office is located, and Ramón Gómez de la Serna. These are blocks located in the town centre, next to Fontanilla beach and at the beginning of Marbella’s famous Golden Mile. They are all urbanizations of the highest architectural level that enjoy great prestige for the beauty of its construction. In Nevado Realty we have a wide selection of properties in Marbella House for sale, please contact us and we will advise you with the experience and knowledge acquired in more than 20 years in the real estate sector in Marbella. 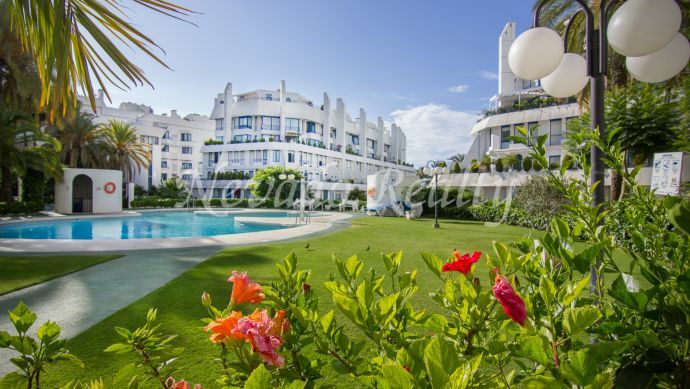 Beautiful ground floor apartment located in Marbella Centre, in a second line beach complex.